The Fan Lady and Lighting, specializes in residential lighting installation.Indoor lighting is a key part of interior design, and can make a house truly feel like a home. Proper residential lighting installation can save you money and conserve natural resources at the same time. Interior lighting systems are one of the most effective ways to increase the safety and security of your home. A well lit house is a deterrent to any criminal. You will feel safe knowing that you are coming home every night to perfectly lit home. One of the most common choices in exterior illumination for homeowners is outdoor security lighting. Keeping an area well lit during the night can go a long way as a deterrent to help keep intruders and burglars away. Brightness and responsiveness are two of the most important characteristics to look for in outdoor security lights. 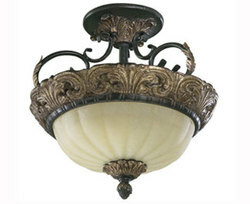 The more illuminant a fixture is, the farther its light will carry. More focused illumination is important as well, so that the light does not “get lost” in the vast darkness of night. The biggest consideration to remember when choosing outdoor security lighting is to select something that is going to make you feel safer in your home. Brightness and motion sensors are definitely two characteristics to consider, but be sure that you choose outdoor security lights that will provide you with a feeling of safety and comfort for you and your family during the nighttime hours. Another choice for exterior lighting is decorative, used to illuminate walkways, plants, shrubs and trees and provide ambiance to a yard. Some of the exterior lighting solutions we offer include; flood lights, security lighting, post lights, porch and coach lighting. To learn more about indoor lighting and outdoor security lighting features, Come in and talk to one of our friendly staff to evaluate your needs.